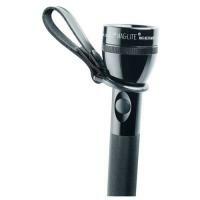 MAGLite is the trusted brand when it comes to handy flashlight accessories and carrying options for daily utility. For an officer on the go, a full-sheath holder with flap cover can be too much to deal with in the heat of the moment when you just need quick access to gear. With MAGLite's C-Cell Belt Flashlight Holder, users get speedy access to a flashlight in the form of a simple ring attached to the full-grain plain leather strap. The holder conveniently snaps onto a duty belt and accommodates any MAGLite C-cell flashlight. Its subtle, low-profile design blends well with various uniform needs.